Should I keep running with a shin splint? I have had this one for about 4 months, been given orthotics by my physio and have now got neutral shoes, but it doesn't seem to be improving. I have got two 10ks and a half marathon in the next 4 months and am at a decent level of fitness so I really don't want to stop running. Thanks for your question about your shin splints. Running injuries are terrible. They throw all your plans in the water. I currently have a knee injury. I was doing fine, building up my runs and was doing my best running in the last few years. Then lifted something heavy, stepped up a little stool and as I did that felt something crack in my knee. I am awaiting a scan, but likely to be some loose cartilage which may require surgery. 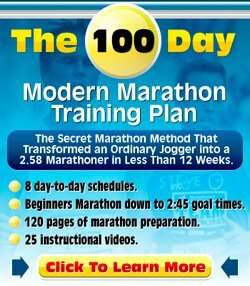 Gone 10k, half marathon and marathon race plans for this season. So, I can relate to what you are saying, however, it is really a bad idea to continue running when you have got a condition caused by running. It will only make it worse. As you have discovered shin splints are hard to get rid of. If you keep on going they can become really chronical and be with you for years. Sorry, this is not what you want to hear, but I can't tell you anything else. I would advise you to read my shin splints page as it offers a few good ideas about products to get when you have got shin splints like a compression wrap that can help your recovery. As long as you have shin splints try to keep in shape by doing other activities, e.g. bike riding, swimming, etc. This will help you maintain a good part of your fitness so you don't have to start from scratch when you have recovered. Best of luck with getting rid of your shin splints. I don't know when I am fit enough to be able to do normal activities such as football, I can't really feel any pain even when i jump, jog etc, but i sometimes feel some minor pain in my shin area. have i healed enough to carry on with sport activities as usual now? It's really hard to say. You basically need to just try it out. Do a short jog, see how you go. If all is good, then do a bit of a longer run next time. Listen to your body.